Need to get rid of hard water stains but not sure where to start? We’re here to help. Not all stains are the same, it depends on the location of stain; inside or outside, in the sun and/or the length of time the stain has had to buildup, you would use different products or even multiple products in some cases. To start, there are cream based products with a mild acid and an abrasive. These can be used inside and outside. It is is easy to use and won’t harm glass or metal surfaces unless you really put extreme pressure in a spot for a while. 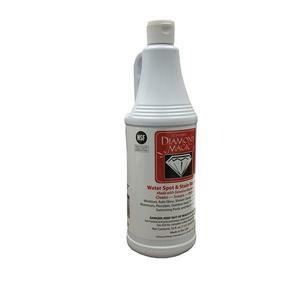 Start with Diamond Magic, a good multipurpose stain remover. Apply a small amount of Diamond Magic to an abrasive pad and start agitating your stains. 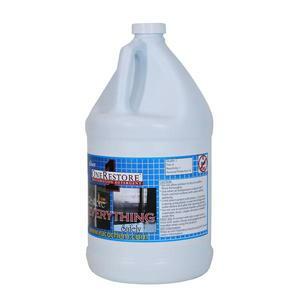 effectively remove moderate hard water stains while reducing exposure from splash and runoff. Moving away from wipes, you can try liquid chemicals. One Restore is a safe to use product and does not have HF acid. Simply apply this with a t-bar and mop or a trigger spray bottle (this will damage the bottles sprayer mechanism in a few hours, so have several bottles) and scrub with a white pad or bronze wool pad. Another type of liquid chemical to try is the Crystal Clear 550. This has a similar chemistry to the wipes. 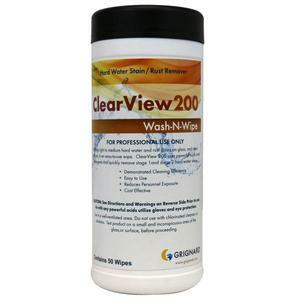 Simply apply this liquid chemical with a t-bar and a mop and scrub with a white pad or bronze wool. Acids can damage some surfaces (may use a tin etch haze on some glass), so don’t use the strong acids on metal. Test a small area of glass to see if it hazes up when the acid is applied. Acids can also burn your skin so make sure to wear your protective gear when using. Acids have fumes that can be undesirable to smell in a closed space like a small bathroom (use a fan to blow a constant air supply) but are usually good to work with outside.